My Book Report: “The Day of Battle” | Paul's Voyage of Discovery & Etc. Later this week I’ll be traveling with my family to Italy. We’ll stay in Tuscany near Florence for a week and then head southward in Tuscany, close to Umbria and the ancient town of Amelia – the place my grandparents left when they came to America in the early 1910’s. Amelia grew up around an ancient hill fort known to the Romans and some scholars consider Amelia the oldest town in Umbria. Whether that’s true isn’t certain, but it is clear that over the centuries, Amelia has seen its share of war. Occupied by the Etruscans and then the Romans, the town’s ancient hilltop fortress was a strategic point in the Second Latin War (remember that one?) way, way back in 340-338 BC. 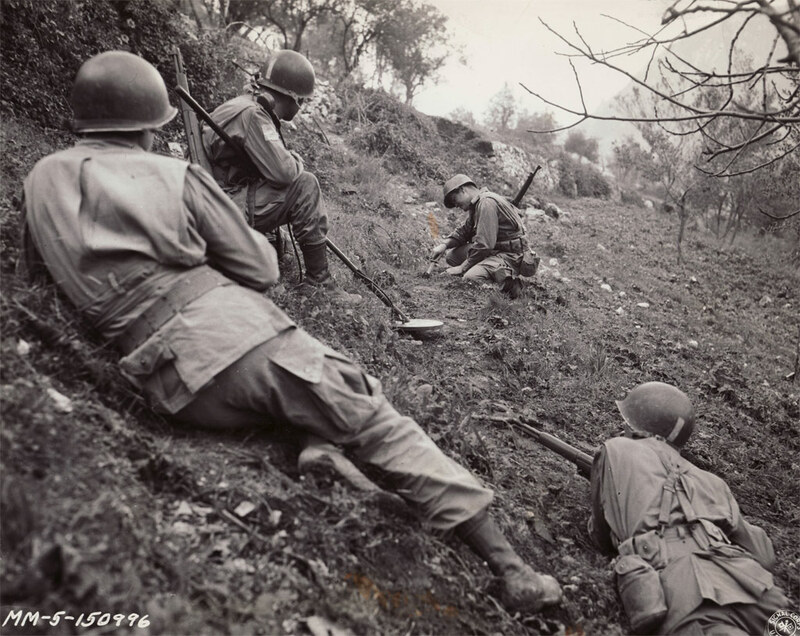 In World War Two, Umbria became a battlefield as retreating Nazi troops, hounded by an inexorable American and Allied advance, slowly withdrew from Italy under fire. 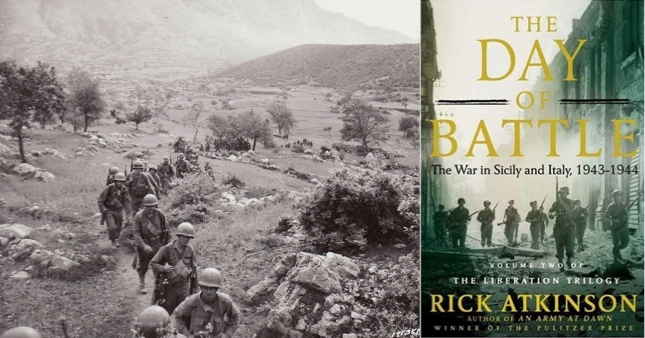 Knowing I was going to be exploring Tuscany and Umbria, a good friend gave me The Day of Battle, Rick Atkinson’s excellent history of the Italian Campaign in World War Two. It’s one of the best-written, most thoroughly researched and yet completely readable books on military history that I’ve ever read. Atkinson knows that all good storytelling is anchored in compelling characters, and he presents a great dramatic cast in The Day of Battle – from icons like Ike and Patton to lesser-known generals like Mark Clark and Lucian Truscott, common soldiers like Audie Murphy and Bill Mauldin, and the writers and reporters who followed them into battle, including Ernie Pyle and Eric Sevareid. 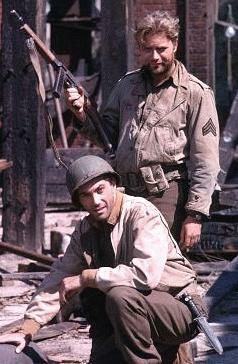 Lt. Hanley and Sgt. Saunders. My childhood heroes on “Combat”. 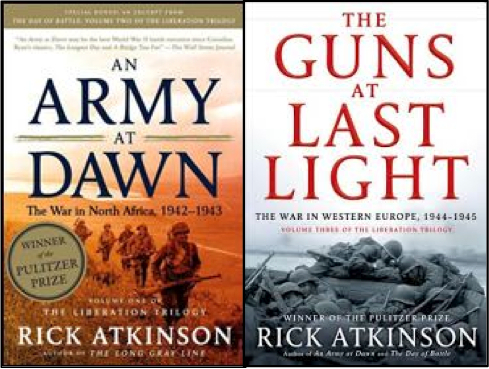 Atkinson recently released The Guns at Last Light: The War in Europe, 1944-1945 — the last volume in his Liberation Trilogy which began with the Pulitzer Prize-winning An Army at Dawn: The War in North Africa, 1942-1943. Most guys my age were introduced to the war in Africa by watching The Rat Patrol. And the movie The Longest Day fixed the Normandy Invasion on June 6, 1944 in our memories and imaginations. Besides, Sergeant Saunders and the rest of his squad on Combat landed on D-Day! However, how many of us know that the U.S. 5th Army liberated Rome on June 4, 1944 – just two days before the Allies assaulted the beaches of Normandy on D-Day? 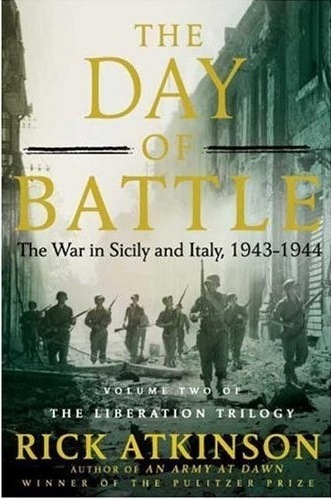 The second volume of Atkinson’s trilogy, The Day of Battle: The War in Sicily and Italy, 1943-1944, filled in the Italian gap in my World War Two consciousness vividly and profoundly. 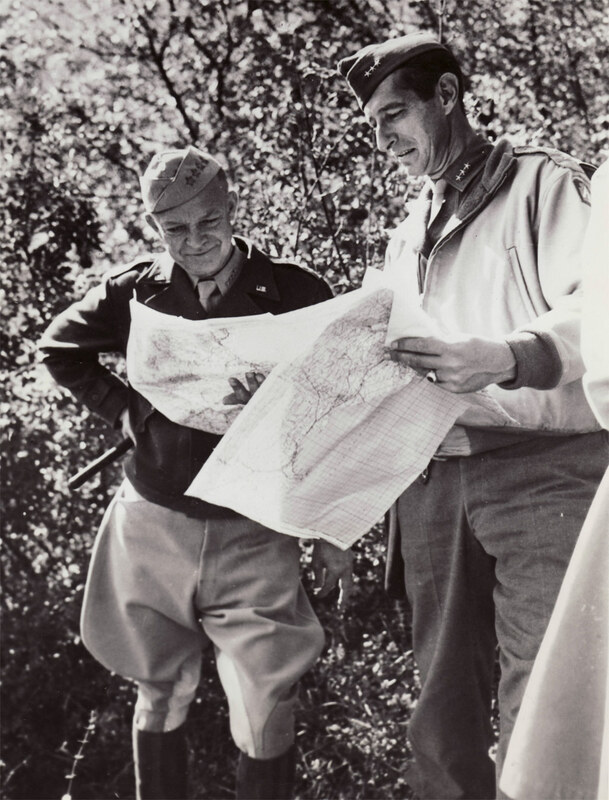 Eisenhower and 5th Army Commander, General Mark Clark, study maps of Italy after the conquest of Sicily. Atkinson deftly portrays the colorful personalities and political pressures behind the decision to undertake the Italian campaign: the machinations of Winston Churchill, the diplomacy and determination of Franklin Roosevelt, and the taxed patience of a chain-smoking General Dwight Eisenhower, the supreme Allied commander in the Mediterranean during the first stages of the invasion. Atkinson lays out the three basic reasons that the Allies fought in Italy: to knock fascist Italy out of the war and to engage as many German divisions as possible, thus taking pressure off the Soviets on the Eastern Front and keeping Hitler from reinforcing his Atlantic defenses before the planned invasion of Normandy. 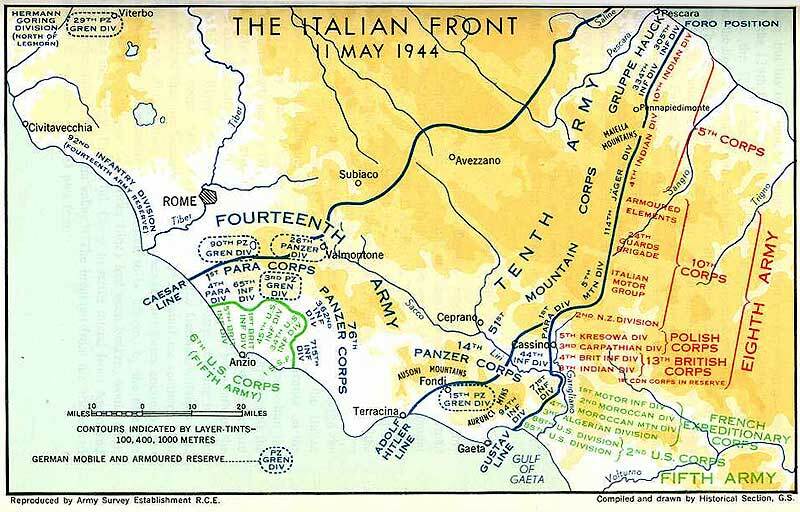 Atkinson points out that military historians have debated whether the Italian campaign was a sideshow and whether or not all the strategic objectives were met – but, as The Day of Battle makes grimly clear, the savagery of the relentless combat for every inch of Italian soil was no sideshow for the cold, wet and dirty soldiers who fought across the beaches, rivers and mountain ridges of Sicily and the Italian peninsula. 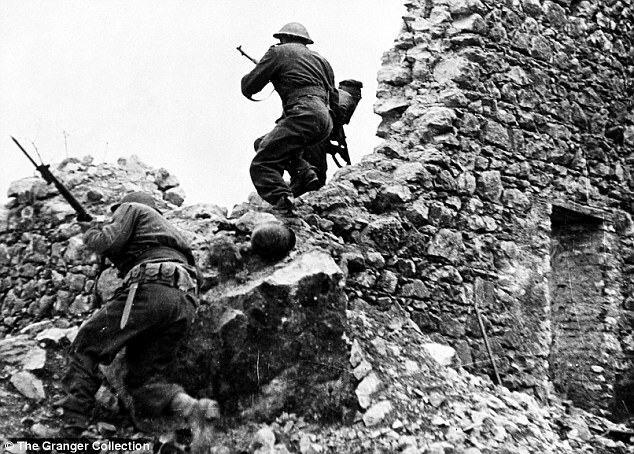 As an American with deep Italian roots, I’m almost shamed to admit how little I knew about the Allied invasion of Sicily, the horrors of the Salerno and Anzio landings, and the slugging, slogging war of attrition waged against desperate German defenders dug into heavily fortified mountain strongholds like San Pietro and Monte Cassino. 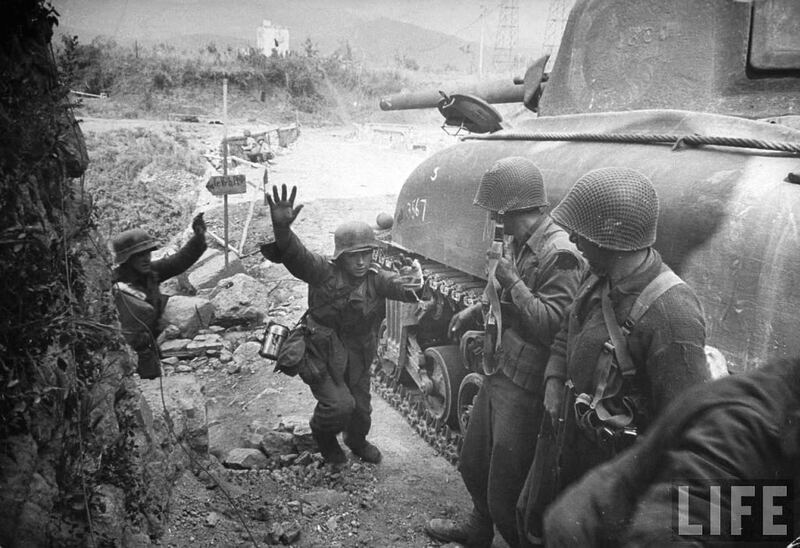 After the hard-won Allied breakthrough at Monte Cassino, and the link-up with American troops that finally broke out of the misery and butchery of the Anzio beachhead, the road to Rome was open. 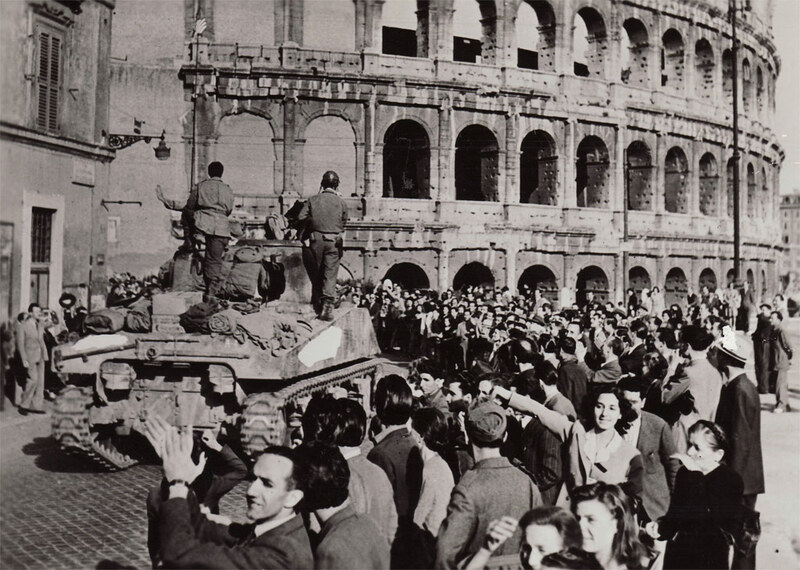 After General Mark Clark’s columns rode into Rome along the same route taken by Caesar’s victorious legions, the Germans fought a long delaying action up the Italian boot. While Umbria and Tuscany were spared the annihilation visited upon southern Italy — from Sicily to Naples to Monte Cassino — there was still a lot of hard fighting in the towns that I’ll be visiting on my family vacation. 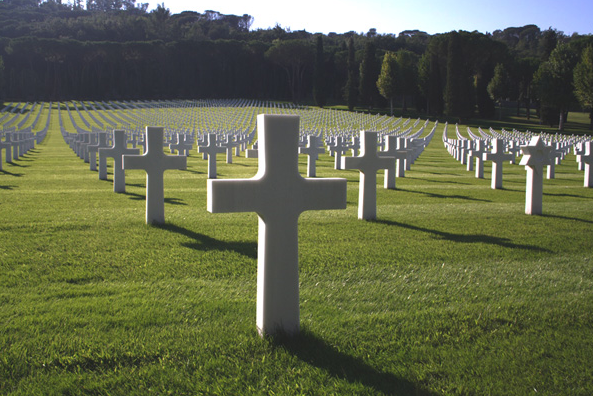 The evidence of that hard fighting is marked by the thousands of graves at the Florence American Cemetery and Memorial. Most of these soldiers died in the battles and skirmishes that took place in the 11 very long months after the capture of Rome and before the Germans in Italy finally surrendered on May 2, 1945. My family will be sure to visit this honored place to pay our respects to the men who liberated my grandparents’ homeland from Nazi tyranny. 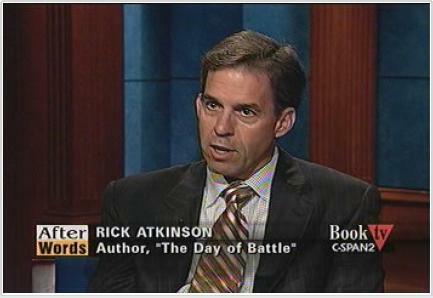 The son of a U.S. Army officer Rick Atkinson grew up on military posts, holds a Master of Arts degree in English literature from the University of Chicago, and has been a reporter, foreign correspondent, and senior editor for 25 years at the Washington Post. All of this has made him a well-rounded and knowledgeable storyteller with a military man’s intimate appreciation of war and soldiering combined with a reporter’s objectivity and a literary flair that makes his work special. Wherever the troops are fighting in The Day Of Battle, Atkinson finds connections to Greek and Roman myth and history that help to make his account transcendent. The Day Of Battle is historical writing at its very best. The only drawback is that now I’ve got to read the other two volumes in Atkinson’s Liberation Trilogy. Alas. So many good books, so little time. I’m sure the staff will be helpful and happy to see you, but you can contact them ahead of time if you want to see specific graves. When I filmed the grave of Kenneth MacLeish at Flanders Field Cemetery, they brought out a bucket of sand from Omaha Beach to press sand into the letters engraved on his cross, the better to see them. I feel your drawback compounded: I have to read all three of them — just as soon as I’m done with WWI. Great “book report.” I will certainly read the book. You will love Umbria. The people are the best in the world. Don’t forget to visit Assisi – a must. You never told me that your grandparents came from Umbria! The Borroni’s are also from there. Have a wonderful time. Monte Cassino is worth a visit. Jeez, the whole country is worth visiting. Glad to hear you’re on your way. Buon viaggio!